This name uses Portuguese naming customs. The first or maternal family name is Coutinho and the second or paternal family name is Correia. The third and youngest son of Esmerelda Coutinho and architect José Carlos Correia, Coutinho was born on 12 June 1992 in Rio de Janeiro, weighing 3.1 kg (6 lbs 10 oz) as a newborn. He was raised in Rio's northern Rocha district between an old shanty town and industrial warehouses. As a child, he followed his elder brothers Cristiano and Leandro to a local concrete football pitch, where he first began playing futsal. With space restricted and the need for skill and improvisation heightened, the diminutive Coutinho thrived. After joining a local football academy on the insistence of his friends grandmother, his father was later approached at a tournament by youth coaches at Vasco da Gama, where he attended a trial and joined their youth system. Coutinho flourished in Vasco da Gama's youth system and was soon called up to the Brazil under-15 football team. In July 2008, at age 16, he was purchased by Italian giants Inter Milan for €4 million. Coutinho remained at Vasco on loan for two years as foreigner footballers were prohibited from playing professional football in Italy until they reach age 18, and became a regular first team player despite his young age. In 2009, he helped Vasco win the Série B title and achieve promotion. In 2010, he made 31 appearances and scored 5 goals in all competitions as he established himself as a key first-team player. Coutinho's move to Inter Milan became effective in July 2010, after he turned 18, with new manager Rafael Benítez and chairman Massimo Moratti being quoted saying, "Coutinho is the future of Inter." 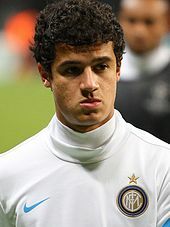 On 27 August 2010, Coutinho made his official debut for Inter coming on as a substitute during the Nerazzurri's 2–0 defeat to Atlético Madrid in the 2010 UEFA Super Cup. After dropping out of selection in the starting line-up, he returned to play in the crucial 3–2 win over Bayern Munich in Germany, a match which Inter would go on to win and progress to the quarter-finals of the UEFA Champions League. On 8 May 2011, in a 3–1 win at home against Fiorentina, Coutinho scored his first goal for Inter from a free-kick that curled over the wall and into the net. His second goal for Inter came in a match against Cagliari on 19 November 2011, where Coutinho received a through-ball from teammate Ricky Álvarez and scored into the bottom left corner of the net to give Inter a 2–0 lead. During the 2011–12 season, Coutinho struggled to establish himself in Inter's first team and on 30 January 2012, he joined La Liga club Espanyol on loan until the end of the season. He made his debut for the club on 4 February 2012 under manager Mauricio Pochettino, starting in a 3–3 draw with Athletic Bilbao. The following month, he scored his first goals for the Catalan side when he scored a brace in a 5–1 victory against Rayo Vallecano. He ultimately scored 5 goals in 16 appearances during his loan with Espanyol before returning to Inter at the end of the season. On 26 January 2013, Premier League club Liverpool agreed an £8.5 million transfer fee with Inter Milan for Coutinho, pending a medical exam and a work permit from the Home Office. Southampton had also expressed an interest in Coutinho, who had played under Southampton manager Mauricio Pochettino at Espanyol, but Coutinho said he would prefer to join Liverpool. On 30 January, Liverpool confirmed the signing of Coutinho on a long-term contract after he was successful in his work permit application, and was given the number 10 shirt. 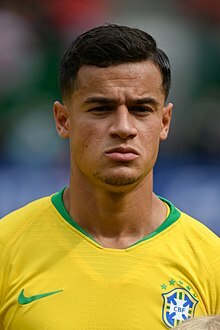 Former director of football at Liverpool Damien Comolli later revealed Liverpool had scouted and ultimately signed Coutinho following a recommendation by then-Inter Milan manager and former Liverpool manager Rafael Benítez, who described the Brazilian as "world class". Coutinho celebrating scoring his first Liverpool goal in a win against Swansea on 17 February 2013. Coutinho made his Liverpool debut on 11 February 2013, replacing Stewart Downing in the 77th minute of a 2–0 defeat against West Bromwich Albion at Anfield. On 17 February, he scored his first goal for Liverpool on his full debut in a 5–0 victory over Swansea City. On 2 March, he set-up Liverpool's first and second goals in a 4–0 win over Wigan Athletic and followed on with a goal in a 3–1 away loss to Southampton and another assist in a 2–1 away win against Aston Villa. His form during the month saw him named as Liverpool's Player of the Month for March. Towards the end of the following month, he was named man of the match for his performance in Liverpool's 6–0 away victory over Newcastle United, claiming two assists and winning the free-kick from which Jordan Henderson scored Liverpool's sixth goal. Coutinho then scored Liverpool's final goal of the season against Queens Park Rangers in Jamie Carragher's final match for the club, executing a driven shot from 30 yards out after being played in by Jordon Ibe. He ended his debut season with Liverpool with a return of 3 goals in 13 Premier League appearances. Coutinho began the 2013–14 season well before injuring his shoulder in a match against Swansea City on 16 September 2013. He was restored to the starting line-up for the 4–0 victory over Fulham at Anfield on 9 November. On 23 November, Coutinho scored the opening goal against Everton in the Merseyside derby in the match's fish minute. Coutinho created his first assist of the season with a corner in the 5–1 thrashing of Norwich City at Anfield. On 26 December, he scored the Reds' only goal in a 2–1 defeat to Manchester City at the Etihad Stadium. On 30 March, Coutinho scored the third goal in a 4–0 victory over Tottenham Hotspur at Anfield. On 13 April 2014, Coutinho scored the winning goal in the 78th minute in a 3–2 win against Manchester City. The result put Liverpool seven points ahead of Manchester City at the top of the Premier League table with four matches remaining. However, Manchester City had six matches remaining and went on to win the title, with Liverpool finishing second. During the season, Coutinho mainly played in central midfield and earned praise from many pundits due to his long and accurate passing from midfield, dribbling skills and creative play to set-up strikers Luis Suárez and Daniel Sturridge. On 17 August 2014, Coutinho started in Liverpool's first match of the 2014–15 season, a 2–1 win against Southampton at Anfield. He created his first assist of the season in a 2–1 win against Swansea City in the fourth round of the League Cup, where he supplied the ball for Dejan Lovren to head the winning goal. Coutinho scored his first goal of the season in a 3–2 away win against Queens Park Rangers on 19 October after coming off the substitutes' bench. On 21 December, Coutinho scored Liverpool's first goal in a 2–2 draw against Arsenal at Anfield. On 31 January 2015, Coutinho assisted both goals for Raheem Sterling and Daniel Sturridge in a 2–0 win over West Ham United. On 3 February 2015, Coutinho signed a new long-term deal set to keep him at Liverpool until 2020. On 4 February, just one day after extending his contract, he scored the winning goal in a 2–1 FA Cup fourth round match against Bolton Wanderers. On 22 February, he scored the opening goal in Liverpool's 2–0 victory over Southampton. In the next match, against Manchester City on 1 March, Coutinho scored the winning goal for Liverpool. He won the PFA Fans' Player of the Month award for February. On 8 April, Coutinho scored the winning goal in the 1–0 FA Cup sixth round replay win against Blackburn Rovers at Ewood Park after slotting the ball into the bottom left corner of the net. Eleven days later, he scored past goalkeeper Shay Given in the FA Cup semi-final against Aston Villa at Wembley Stadium, although Villa won 2–1. On 26 April, Coutinho was the only Liverpool player named in the PFA Team of the Year. On 2 May, Coutinho scored the opening goal, and provided the assist in the 87th minute for Steven Gerrard's winner in a 2–1 win over Queens Park Rangers. Seventeen days later, he was named the team's Player of the Season. At the end of the season, he was shortlisted for the PFA Players' Player of the Year and the PFA Young Player of the Year, ultimately losing to Eden Hazard and Harry Kane respectively. On 9 August 2015, Coutinho scored the winning goal in the 86th minute with a bending 25-yard strike in Liverpool's first match of the Premier League season, a 1–0 victory away to Stoke City. One week later, when Liverpool won at home against AFC Bournemouth through Christian Benteke's goal, the Premier League later confirmed the goal should not have counted as Coutinho was offside when it was scored. On 29 August, Coutinho was sent-off in a 0–3 home defeat to West Ham United, being booked the first time for dissent and the second for a foul on Dimitri Payet. On 26 September, he assisted two goals in a 3–2 win over Aston Villa at Anfield. On 31 October, he scored his first Liverpool brace, scoring two long-range strikes to overturn a deficit and seal a 3–1 victory over Chelsea at Stamford Bridge. On 21 November, Coutinho scored in a 4–1 victory over Manchester City at the City of Manchester Stadium, the first time he had scored in three consecutive Premier League matches. He also assisted Roberto Firmino's first goal for Liverpool. On 5 January 2016, Coutinho suffered a hamstring injury in a 1–0 win over Stoke City at the Britannia Stadium in the first leg of the League Cup semi-finals, which ruled him out for five weeks. On 9 February, he returned to score a goal to make it 1–1 against West Ham United in the FA Cup, although Liverpool lost in extra time. On 28 February, in the 2016 League Cup Final, Coutinho scored an 83rd-minute equalizer in a 1–1 draw against Manchester City. However, in the subsequent penalty shootout, his "hesitant" attempt was one of three saved by victorious City goalkeeper Willy Caballero. On 17 March, Coutinho scored Liverpool's goal in a 1–1 draw with Manchester United at Old Trafford, helping Liverpool to a 3–1 aggregate victory that saw them progress to the quarter-finals of the UEFA Europa League. On 14 April, he scored as Liverpool defeated Borussia Dortmund 4–3 in the second leg of their quarter-final. On 13 April, Coutinho was one of six players nominated for the 2016 PFA Young Player of the Year award. On 21 April, he scored the final goal of a 4–0 Merseyside derby win over Everton. Coutinho on the last day of the 2016–17 season. He scored the second goal with a 25-yard free kick in a 3–0 win to ensure Champions League qualification. On 14 August 2016, Coutinho scored twice in Liverpool's Premier League season opener in a 4–3 win against Arsenal. His first goal was a curling 30-yard free kick to equalize at the end of the first half. He assisted Dejan Lovren's opener against Chelsea in an eventual 2–1 win. He also scored a goal and provided an assist against Hull City and was voted man of the match. After this match, he did not register any goals or assists for two games, but was very impressive with his performances against Manchester United and Swansea City. He was voted man of the match for three successive matches for Liverpool against West Bromwich Albion, Crystal Palace and Watford. After 11 league matches, Liverpool reached the top of the table for the first time since May 2014, with Coutinho having played an important role. On 26 November, Coutinho suffered ankle ligament damage in the first half of a 2–0 win against Sunderland, which ruled him out of action until 11 January against Southampton in the EFL Cup first leg. In January, Coutinho signed a new five-year contract with no release clause with Liverpool which would keep him at the club until 2022. He then was named man of the match in his performance in the 3–1 Merseyside victory over Everton after scoring and assisting a goal. Coutinho became the all-time leading Brazilian goalscorer in Premier League history after scoring his 30th Premier League goal in a win against Stoke City. In August 2017, Liverpool rejected a £72 million bid from Barcelona for Coutinho, prompting the player to submit a transfer request over email. Two more improved bids from Barcelona were rejected, leading Barça director Albert Soler to claim Liverpool wanted £183 million for Coutinho, which Liverpool denied. Coutinho made his first appearance of the season for Liverpool on 13 September 2017, coming on as a substitute for Emre Can in the 75th minute of a 2–2 draw against Sevilla in the UEFA Champions League. He scored his first Premier League goal of the season on 23 September 2017 in a 3–2 victory at Leicester City. On 6 December, Coutinho captained Liverpool for the first time in the absence of Jordan Henderson and scored his first hat-trick for the club in a 7–0 win against Spartak Moscow in the final group stage match of the season's Champions League. His second, a tap-in from Roberto Firmino's pass, was his 50th career goal for the Reds in all competitions. Coutinho had previously also netted in Liverpool's 7–0 victory over Maribor which was the club's joint-largest ever away win in the competition, and largest away win by an English club. Later that month, he opened the scoring in a 4–0 win over AFC Bournemouth, a result which saw Liverpool become the first team in Premier League history to win four consecutive league matches by at least a three-goal margin. On 26 December, he captained Liverpool in his 200th appearance for the club, scoring once and providing an assist in a 5–0 league win over Swansea City to score his third goal in as many league matches. Coutinho played what transpired to be his final match for Liverpool on 30 December 2017, featuring prominently in a 2–1 league win against Leicester City at Anfield. On 31 December, sportswear company Nike—Coutinho and Barcelona's sponsor—advertised Coutinho's image on the back of a Barcelona shirt, despite Coutinho still being a Liverpool player at the time. Coutinho was omitted from the Liverpool squad to face Burnley on New Year's Day with a minor thigh injury. He left Liverpool having registered 12 goals and 9 assists in 20 appearances for the club in 2017–18. On 6 January 2018, Liverpool confirmed they had reached an agreement with La Liga club Barcelona for the transfer of Coutinho. His transfer fee was reported to be an initial £105 million, which could rise to £142 million with various clauses being met. During his medical, he was diagnosed with a thigh injury sustained a few days before joining Barcelona, ruling him out for three weeks. He made his debut for Barcelona on 25 January 2018, in a 2–0 (2–1 on aggregate) win against his former club Espanyol in the quarter-finals of the Copa del Rey, coming on as a 68th-minute substitute for captain Andrés Iniesta. Assisted by his former Liverpool teammate Luis Suárez, Coutinho scored his first Barcelona goal on 8 February 2018 against Valencia in the second leg of the Copa del Rey semi-finals just four minutes after coming on as a half-time substitute. On 28 October 2018, Coutinho scored the curtain raising goal, his first El Clásico goal, in a 5–1 win against Real Madrid. Coutinho (center) playing for Brazil battles Alexis Sánchez of Chile in 2015. 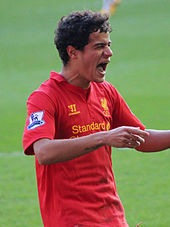 Having made youth appearances for Brazil from the under-14 team upwards, Coutinho became a key player in the Brazilian squad that won the 2009 South American Under-17 Football Championship, scoring three goals. Coutinho made his first senior appearance in a Brazil shirt on 7 October 2010, starting in a friendly match against Iran. He was omitted from the final squad for the 2014 FIFA World Cup in Brazil by manager Luiz Felipe Scolari. On 19 August 2014, Coutinho was called up to the national squad by new Brazil manager Dunga for the friendly matches against Colombia and Ecuador in September, and played the final 25 minutes of the match against Ecuador. On 29 March 2015, he was selected to start in Brazil's 1–0 friendly victory over Chile in London. On 5 May 2015, Coutinho was included in Brazil's squad for the 2015 Copa América, and he scored his first international goal on 7 June during a 2–0 friendly win over Mexico at Allianz Parque. Coutinho was included in Brazil's squad for the Copa América Centenario in the United States. On 8 June, in the second group match at the Citrus Bowl, he scored a hat-trick in a 7–1 win against Haiti. Brazil did not advance past the group stage after losing 0–1 to Peru. On 28 March 2017, Coutinho scored in a 3–0 win against Paraguay that ensured Brazil's 2018 FIFA World Cup qualification. In May 2018, Coutinho was named in the squad for the 2018 FIFA World Cup in Russia. On 17 June 2018, he scored in his FIFA World Cup debut with a trademark right-footed curling shot from outside the penalty area into the corner of the goal in Brazil's 1–1 draw with Switzerland in their opening match at the World Cup. In the following match against Costa Rica on 22 June, he scored the opening goal in injury time of the second half and was named man of the match as Brazil won 2–0. On 6 July, he assisted Renato Augusto's goal in a 1–2 quarter-final defeat to Belgium as Brazil were eliminated from the World Cup. Considered to be an archetypal Brazilian number 10 playmaker, Coutinho has been used as an attacking midfielder, second striker and on the flanks, where he excels at providing assists for teammates. He has a penchant for scoring from curling shots with his right foot from just outside the penalty area into the top corner of the goal. Due to his dribbling ability, pace and agility, he has been compared to Lionel Messi and Ronaldinho by his former Espanyol manager Mauricio Pochettino, who also said, "Philippe... he has a special magic in his feet." Former Brazilian striker Careca has also compared Coutinho to Zico due to his creativity, and he has been highly praised by his Liverpool teammates. Coutinho's vision and passing ability earned him the nickname "Little Magician" by Liverpool fans and his precocious ability has also led his team's supporters to give him the nickname "The Kid". Although naturally right-footed, Coutinho is capable of playing with both feet and can strike the ball well from distance. Coutinho is sponsored by sportswear company Nike. He wears Nike Phantom Vision boots. Coutinho features in the video game Pro Evolution Soccer. He appears on the cover of Pro Evolution Soccer 2019. When Coutinho moved to Italy at age 18 to join Inter Milan, he was joined there by his parents and then-girlfriend Aine, whom he had first met at a friend's party. On moving to Espanyol, his parents returned to Brazil. He married Aine in the summer of 2012 in Brazil. Coutinho has said his idol is Ronaldinho. He has tattoos stretching from his fingers to his biceps which form tributes to his parents, two brothers, and his wife Aine. Coutinho is a devout Christian. During the early-morning hours of 20 February 2018, Coutinho had been eating dinner with his family the previous night and returned to his Barcelona home to find his house burgled. It was reported he was having construction work done on his house, which made it easier for burglars to break in. In August 2018, Coutinho gained a Portuguese passport through his wife, no longer making him a non-EU player. ^ "Premier League Clubs submit Squad Lists" (PDF). Premier League. 3 September 2014. p. 20. Archived from the original (PDF) on 22 October 2014. ^ "2018 FIFA World Cup Russia: List of players: Brazil" (PDF). FIFA. 10 June 2018. p. 4. Retrieved 11 June 2018. ^ "Philippe Coutinho". FC Barcelona. Retrieved 23 January 2018. ^ Carroll, James (30 April 2014). "Video: Get to know Philippe Coutinho". Liverpool F.C. Retrieved 26 August 2015. ^ a b c "Chelsea's Eden Hazard named PFA Player of the Year". BBC Sport. 26 April 2015. Retrieved 7 May 2018. ^ "Pele on Philippe Coutinho and England's El Clásico". SB Nation. 20 March 2015. Retrieved 26 August 2015. ^ "Coutinho leaves Liverpool, joins Barcelona on third-most expensive deal". Fox. 18 June 2018. ^ Staff writer(s). "Biografia: O berço". Archived from the original on 19 August 2016. Retrieved 8 November 2016. ^ a b c d e f Reddy, Melissa (10 August 2015). "Philippe Coutinho: The secret life of 'O Mágico'". CNN. Retrieved 25 August 2015. ^ "Coutinho, 4 milioni per il Pato di Moratti". La Gazzetta dello Sport (in Italian). 23 July 2008. Retrieved 20 November 2010. ^ a b c d e Smith, Ben (26 January 2013). "Liverpool agree a deal for Inter Milan's Philippe Coutinho". BBC Sport. Retrieved 3 March 2015. ^ "Philippe Coutinho: Liverpool sign Inter Milan midfielder". BBC Sport. 30 January 2013. Retrieved 6 January 2018. ^ Austin, Simon (29 January 2013). "Philippe Coutinho transfer a gamble for Liverpool". BBC Sport. Retrieved 3 March 2015. ^ Dawkes, Phil (15 March 2011). "B Munich 2–3 Inter (agg 3–3)". BBC Sport. Retrieved 3 March 2015. ^ a b c Torres, Carmen; Moyo, Marc (7 January 2018). "Fast but shy: The young unknown Coutinho who debuted under Pochettino at Espanyol". Marca. Spain. Retrieved 8 January 2018. ^ Pearce, James (29 January 2013). "Philippe Coutinho set for medical as he closes in on move for Liverpool FC". Liverpool Echo. ^ Smith, Ben (26 January 2013). "Liverpool agree a deal for Inter Milan's Philipe Coutinho". BBC Sport. Retrieved 26 January 2013. ^ "Reds confirm Coutinho deal". Liverpoolfc.com. 30 January 2013. Archived from the original on 3 February 2013. ^ "New boy handed vacant No.10 shirt". Liverpoolfc.com. 30 January 2013. Archived from the original on 3 February 2013. ^ Redmond, Robert (February 2017). "Here's why Liverpool have Rafa Benitez to thank for Philippe Coutinho". Sports Joe. Retrieved 6 January 2018. ^ "Liverpool 0–2 West Brom" BBC Sport. 11 February 2013. Retrieved 12 February 2013. ^ "Liverpool 5–0 Swansea" BBC Sport. 17 February 2013. Retrieved 17 February 2013. ^ Fox, Callum (7 May 2013). "Liverpool's Coutinho grabs second successive player of the month award". Samba Foot. Retrieved 6 January 2018. ^ Lewis, Aimee (27 April 2013). "Newcastle 0–6 Liverpool". BBC Sport. Retrieved 6 January 2018. ^ a b "Liverpool 3–2 Man City". BBC Sport. 13 April 2014. ^ Ornstein, David (17 August 2014). "Liverpool 2 – Southampton 1". BBC Sport. Retrieved 14 February 2015. ^ "Liverpool 2 – 1 Swansea". BBC Sport. 28 October 2014. Retrieved 29 October 2014. ^ "Queens Park Rangers 2–3 Liverpool". BBC Football. 19 October 2014. Retrieved 5 February 2015. ^ McNulty, Phil (21 December 2014). "Liverpool 2–2 Arsenal". BBC Sport. Retrieved 5 February 2015. ^ "Premier League: Daniel Sturridge scores on return as Liverpool prove too strong for West Ham". foxsports.com.au. 1 February 2015. Retrieved 1 February 2015. ^ "Philippe Coutinho: Brazilian signs new long-term deal at Liverpool". BBC Sport. 3 February 2015. Retrieved 3 February 2015. ^ "Liverpool's Philippe Coutinho deals body blow to Manchester City hopes". The Guardian. 1 March 2015. ^ a b Carroll, James (2 March 2015). "Coutinho voted PFA Fans' POTM". liverpoolfc.com. Liverpool F.C. Retrieved 3 March 2015. ^ "Blackburn Rovers 0–1 Liverpool". BBC Sport. 8 April 2015. Retrieved 9 April 2015. ^ "Aston Villa 2–1 Liverpool". BBC Sport. 19 April 2015. Retrieved 20 April 2015. ^ "Liverpool 2–1 Queens Park Rangers". BBC Sport. 2 May 2015. Retrieved 3 May 2015. ^ "Raheem Sterling wins Liverpool's Young Player of Year award". BBC Sport. 19 May 2015. Retrieved 20 May 2015. ^ "Phil wins four prizes at Players' Awards". Liverpool F.C. 19 May 2015. Retrieved 20 May 2015. ^ Shaw, Chris (20 May 2015). "Coutinho: I will treasure my awards". Liverpool F.C. Retrieved 20 May 2015. ^ "Men's PFA Young Player of the Year: Nominees". The PFA. 16 April 2015. Retrieved 12 June 2015. ^ "PFA awards: Kane, Hazard, De Gea, Coutinho on both shortlists". BBC Sport. 16 April 2015. Retrieved 16 April 2015. ^ "Chelsea's Eden Hazard named PFA Player of the Year". BBC Sport. 26 April 2015. Retrieved 27 April 2015. ^ "Stoke 0–1 Liverpool". BBC Sport. 9 August 2015. Retrieved 9 August 2015. ^ "Stoke City 0–1 Liverpool: Philippe Coutinho strike hands Rodgers revenge". Sky Sports. 10 August 2015. Retrieved 9 August 2015. ^ "Christian Benteke goal should not have stood". Sky Sports. 21 August 2015. Retrieved 21 August 2015. ^ "Liverpool hammered by West Ham as Coutinho sent off". ESPN. 29 August 2015. Retrieved 29 August 2015. ^ "Liverpool 3–2 Aston Villa". BBC Sport. Retrieved 27 October 2015. ^ McNulty, Phil (31 October 2015). "Chelsea 1–3 Liverpool". BBC Sport. Retrieved 31 October 2015. ^ "Jurgen Klopp Masterminds stunning win". Sky Sports. 22 November 2015. Retrieved 21 November 2015. ^ "West Ham United 2–1 Liverpool (aet)". BBC Sport. Retrieved 11 March 2016. ^ Taylor, Daniel (28 February 2016). "Willy Caballero shootout heroics help Manchester City past Liverpool". The Guardian. Retrieved 28 February 2016. ^ "Manchester United 1–1 Liverpool". BBC Sport. 20 April 2016. ^ "Liverpool 4–3 Borussia Dortmund". BBC Sport. ^ "PFA Young Player of the Year: Tottenham duo Dele Alli and Harry Kane lead the nominations". Daily Mirror. 13 April 2016. ^ "Liverpool 4–0 Everton". BBC Sport. 21 April 2016. ^ "Arsenal 3–4 Liverpool". BBC Sport. 14 August 2016. ^ "Liverpool and Coutinho stun stuttering Arsenal in seven-goal thriller". The Guardian. 14 August 2016. Retrieved 16 August 2016. ^ "Philippe Coutinho Match History". whoscored.com. Retrieved 10 November 2016. ^ "Jürgen Klopp insists Liverpool can cope without injured Philippe Coutinho". The Guardian. 28 November 2016. Retrieved 29 November 2016. ^ "Philippe Coutinho signs new long-term Liverpool deal with no buyout clause". The Guardian. 25 January 2017. Retrieved 25 January 2017. ^ "Liverpool 3–1 Everton". BBC. 1 April 2017. Retrieved 1 April 2017. ^ "Liverpool's Philippe Coutinho is the top scoring Brazilian in Premier League history". Sky Sports. 8 April 2017. Retrieved 8 April 2017. ^ a b Mandeep Sanghera (2 September 2017). "Philippe Coutinho: Liverpool deny Barcelona claim that Reds wanted £183m". BBC Sport. Retrieved 8 October 2017. ^ "Philippe Coutinho: Liverpool midfielder submits transfer request". BBC Sport. 11 August 2017. Retrieved 8 October 2017. ^ Phil McNulty (18 August 2017). "Philippe Coutinho: Liverpool reject third Barcelona bid for Brazil midfielder". BBC Sport. Retrieved 8 October 2017. ^ "Liverpool 2–2 Sevilla". BBC Sport. 13 September 2017. ^ "Leicester City 2–3 Liverpool". BBC Sport. 23 September 2017. ^ "Philippe Coutinho hat-trick inspires 7–0 Liverpool romp against Spartak Moscow". The Guardian. 6 December 2017. Retrieved 7 December 2017. ^ "'Fab Four' fire 7-goal Liverpool into last 16". Sport 24. 7 December 2017. Retrieved 18 December 2017. ^ Burton, Chris (17 October 2017). "Liverpool record Champions League firsts with seven goal Mauling". Goal. Retrieved 18 October 2017. ^ Hughes, Simon (26 December 2017). "Philippe Coutinho provides timely reminder why Barcelona want to sign him by inspiring rout of Swansea". The Independent. Retrieved 26 December 2017. ^ "Liverpool 2–1 Leicester City". BBC Sport. 30 December 2017. ^ "Philippe Coutinho: Nike advertises Liverpool player's name on Barcelona shirts". BBC Sport. Retrieved 22 July 2018. ^ "Coutinho left out of Reds squad". Sky Sports. 1 January 2018. ^ a b "Liverpool agree Coutinho sale". Sky Sports. 6 January 2018. ^ "Liverpool's Philippe Coutinho missing more games since Barcelona saga". ESPN. 5 January 2018. ^ "Liverpool FC statement: Coutinho to leave LFC". Liverpool F.C. 6 January 2018. ^ "Coutinho is a Barça player". FC Barcelona. 6 January 2018. ^ "Philippe Coutinho: Liverpool agree £142m deal with Barcelona for Brazil midfielder". BBC Sport. 6 January 2018. Retrieved 18 January 2018. ^ "Philippe Coutinho to join Barcelona after £142m deal agreed with Liverpool". The Guardian. 6 January 2018. ^ "Philippe Coutinho to Barcelona: Brazil star out for three weeks injured". Goal.com. Retrieved 8 January 2018. ^ "FC Barcelona v Espanyol: Derby delight (2–0) | FC Barcelona". FC Barcelona. Retrieved 26 January 2018. ^ "Barcelona news: Philippe Coutinho scores first Barcelona goal | Goal.com". Retrieved 9 February 2018. ^ "Philippe Coutinho's Clásico goal was pure Barça | FC Barcelona". FC Barcelona. Retrieved 30 October 2018. ^ "Iran 0 Brazil 3". Goal.com. 7 October 2010. Retrieved 13 August 2013. ^ "Brazil World Cup squad: Scolari leaves out Kaká and Philippe Coutinho". The Guardian. 7 May 2014. Retrieved 3 March 2015. ^ "Philippe Coutinho recalled to Brazil squad for friendlies against Colombia and Ecuador". Sky Sports. 19 August 2014. Retrieved 3 March 2015. ^ "Brazil v Colombia: Neymar gives Dunga winning start". BBC Sport. 6 September 2014. Retrieved 3 March 2015. ^ "Brazil 1–0 Ecuador". BBC Sport. 10 September 2014. Retrieved 3 March 2015. ^ "Roberto Firmino strike gives Brazil win over Chile in Emirates friendly". The Guardian. 29 March 2015. Retrieved 4 April 2015. ^ "Dunga corta Oscar e chama Robinho e Casemiro para a Copa América" (in Portuguese). UOL. 5 May 2015. Retrieved 8 May 2015. ^ "Philippe Coutinho scores his first Brazil goal in Mexico win". Sky Sports. 8 June 2015. Retrieved 8 June 2015. ^ "Liverpool's Philippe Coutinho scores hat-trick for Brazil". BBC Sport. 8 June 2016. Retrieved 9 June 2016. ^ "Copa America: Brazil knocked out by Peru in group stages". BBC Sport. 13 June 2016. ^ "World Cup: Neymar named in Brazil's 23-man squad". BBC Sport. 14 May 2018. Retrieved 17 June 2018. ^ "For Brazil, a Disappointing Start to World Cup". The New York Times. 17 June 2018. Retrieved 17 June 2018. ^ "Brazil 2–0 Costa Rica". FIFA. 22 June 2018. Retrieved 22 June 2018. ^ "Brazil 1–2 Belgium". FIFA. 6 July 2018. Retrieved 6 July 2018. ^ Mattia Bonasia (9 July 2013). "Chi è Philippe Coutinho "The Kid", Numero 10 del Liverpool" [Who is Philippe Coutinho "The Kid", Liverpool's number 10] (in Italian). Archived from the original on 23 September 2015. Retrieved 24 May 2015. ^ "Coutinho's cracking curler". Sky Sports. Retrieved 18 June 2018. ^ a b Lorenzo Palmieri (3 December 2013). "Philippe Coutinho, "the Kid" che vuole conquistare Scolari" [Philippe Coutinho, "the Kid" who wants to win over Scolari] (in Italian). Mai Dire Calcio. Retrieved 24 May 2015. ^ a b Christian Liotta (6 June 2010). "Careca sponsorizza Milito e... Coutinho: "Ricorda Zico"" [Careca sponsors Milito and...Coutinho: "He reminds me of Zico"] (in Italian). La Gazzetta dello Sport. Retrieved 24 May 2015. ^ "Philippe Coutinho similar to Lionel Messi, says Mauricio Pochettino". BBC Sports. 15 March 2013. Retrieved 4 February 2015. ^ a b "Coutinho the 'little magician' can take Liverpool a long way, says Lallana". ESPN FC. 1 March 2015. Retrieved 12 June 2015. ^ Glenn Price (18 August 2016). "Liverpool's Coutinho can reach Messi, Suarez, Ronaldo level – Henderson". ESPN FC. Retrieved 18 August 2016. ^ Benji Inwood (22 October 2010). "Europe's rising stars". The Independent. Retrieved 25 May 2015. ^ Jamie Sanderson (1 March 2015). "Liverpool's Philippe Coutinho can't stop scoring FIFA 15 'Finesse Shot' goals". Metro. Retrieved 25 May 2015. ^ "Kylian Mbappé Just Leaked an Amazing New R9-Inspired Nike Mercurial Superfly VI". Versus. 29 June 2018. ^ "Coutinho leads PES 2019 game cover". thestar.com.my. 13 May 2018. Retrieved 14 May 2018. ^ Burt, Jason (14 December 2013). "Tottenham Hotspur v Liverpool: Brazilian midfielder Philippe Coutinho inspired by hero Ronaldinho". The Daily Telegraph. Retrieved 16 August 2016. ^ Whaling, James (20 February 2018). "Philippe Coutinho's house 'burgled' while Barcelona star was out for dinner with his family". Mirror. Retrieved 1 March 2018. ^ "Coutinho's Portuguese passport confirmed to free up Barcelona squad space". Marca. 10 August 2018. Retrieved 10 August 2018. ^ Philippe Coutinho at Soccerway. Retrieved 11 March 2018. ^ "Coutinho, Philippe". National Football Teams. Retrieved 20 August 2015. 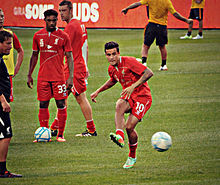 ^ name="NFT"> "Coutinho, Philippe". National Football Teams. Retrieved 24 March 2018. ^ "Philippe Coutinho" (in Italian). inter.it. Retrieved 23 May 2018. ^ McNulty, Phil (28 February 2016). "Liverpool 1–1 Manchester City". BBC Sport. Retrieved 29 December 2018. ^ McNulty, Phil (18 May 2016). "Liverpool 1–3 Sevilla". BBC Sport. Retrieved 29 December 2018. ^ "Philippe Coutinho". FC Barcelona. Retrieved 21 April 2018. ^ "Phil wins four prizes at Players' Awards". Liverpool F.C. 19 May 2015. Retrieved 19 May 2015. ^ a b "Quartet of accolades for Philippe Coutinho at LFC Players' Awards". Liverpool F.C. Retrieved 12 May 2016. ^ Stillman, Tim (31 December 2016). "Philippe Coutinho wins the Samba Gold 2016". Sambafoot. Sambafoot. Retrieved 31 December 2016. ^ http://www.fsf.org.uk/. "Philippe Coutinho wins FSF Player of the Year Award | Football Supporters' Federation". www.fsf.org.uk. Retrieved 30 August 2017. ^ "2016–2017 World 11: the Reserve Teams – FIFPro World Players' Union". FIFPro. 23 October 2017. Retrieved 23 October 2017. ^ "World 11: The Reserve Team for 2017-18". FIFPro. 24 September 2018. Retrieved 25 September 2018. ^ FIFA.com (18 July 2018). "FIFA World Cup Fan Dream Team". Archived from the original on 26 June 2018. Retrieved 23 July 2018. ^ "Kane crowned King, Mina the PPG VIP". FIFA.com. Fédération Internationale de Football Association. Retrieved 25 July 2018. ^ FIFA.com. "2018 FIFA World Cup Russia™ - FIFA.com". www.fifa.com. Retrieved 16 July 2018. 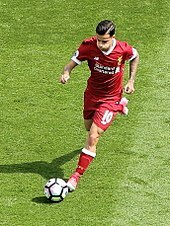 Wikimedia Commons has media related to Philippe Coutinho.